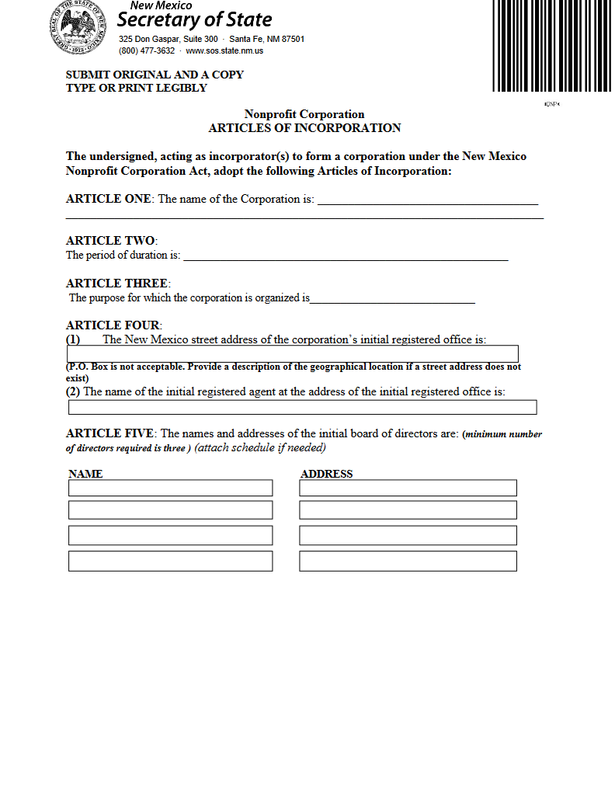 The New Mexico Articles of Incorporation Domestic Nonprofit Corporation | Form DNP are to be submitted in duplicate to the New Mexico Corporations and Businesses Bureau as fulfillment of a requirement of the New Mexico Secretary of State. This office is part of the Secretary of State and acts as the governing authority over such matters. All corporations wishing to form and operate in this state must satisfy this entity’s requirements along with other interested governing bodies such as the Internal Revenue Service. All such governing bodies will mostly operate separately from the other but may require a certain amount of coordination. It is strongly recommended that an Incorporator(s) seek out as much information as possible regarding the process of entity formation, including consultation with institutions such as the Internal Revenue Services and with independent consultants (i.e. an attorney or an accountant). 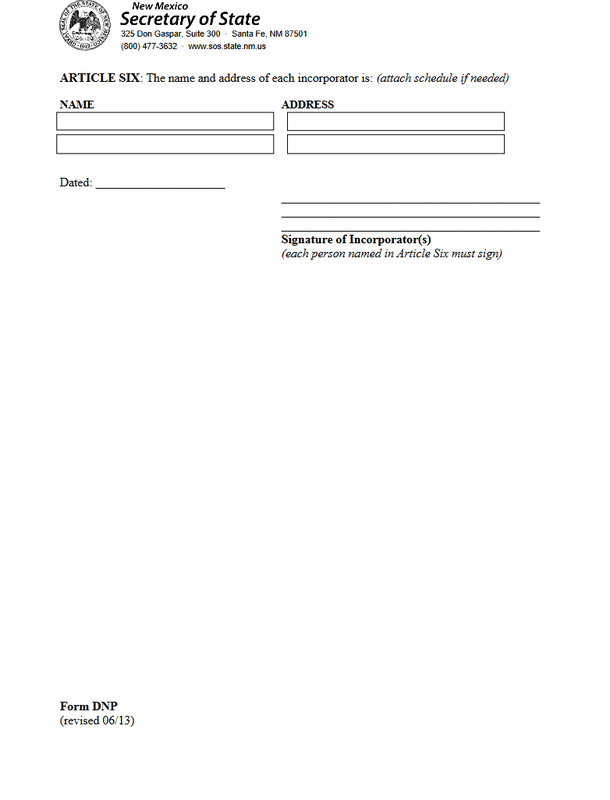 This form must be submitted by mail with a full payment of the Filing Fee ($25.00) in the form of a check or money order made payable to “Secretary of State.” In addition to the New Mexico Articles of Incorporation Domestic Nonprofit Corporation | Form DNP, Filing Fee Payments, and its supporting documents, this submittal package should be submitted with a completed New Mexico Statement of Acceptance of Appointment By Designated Initial Registered Agent and Document Delivery Form. All filings may be mailed to Secretary of State, 325 Gaspar Suite 300, Santa Fe, NM 87501. Step 2 - Report the Full Name of the nonprofit corporation in Article One on the blank space provided. Step 3 - On the blank line, in Article Two, report any Period of Duration imposed on this corporation’s lifespan or write in the word “Perpetual” if this corporation has no intention of ceasing its activities on a particular preset date. Step 4 - In Article Three write out the Purpose of this corporation’s activities on the blank line provided. Note: If this forming nonprofit intends on applying for Tax-Exempt Status in the future, you should contact the Internal Revenue Service before filling out this section. Step 5 - In the first box of Article Four, report the either the Physical Address or a very specific description of the physical geographical location of the Registered Office. You may not use a P.O. Box here. This must be a physical location. Step 6 - In the second box of Article Four, report the Full Name of the initial Registered Agent. Step 7 - Report the Full Names and Addresses of all the Directors on the initial Board of Directors in the spaces provided. There must be at least three Directors on the initial Board. If there is not enough room to report each individual you may complete this list on a separate sheet of paper. Step 8 - In Article Six, you must list the Name and Address of each Incorporator. Step 9 - Below this will be the Date and Signature Lines. The blank line labeled “Date” must be filled in, at the time of Signing, with the Date the Signatures are provided. In the lower right hand corner of this page will be several lines where all Incorporators must sign their Names. Step 10 - You must obtain the completed and signed New Mexico Statement of Acceptance of Appointment by Designated Initial Registered Agent, complete the Document Delivery Form, and make sure all questions you have continued on a separate document are clearly labeled and attached. These documents should be packaged with two completed and signed New Mexico Articles of Incorporation Domestic Nonprofit Corporation | Form DNP (one original and one copy), any supporting or required documentation (depending upon the nature of your nonprofit corporation), and a check or money order payable to Secretary of State for $25.00 then mail this package to the New Mexico Secretary of State’s Corporations and Businesses Bureau. Note: If you are submitting multiple forms with multiple payments they must all be paid for at the time of submittal with a check or money order. This may be one lump sum.